For every vertical of industry, we present a cost effective solution in the form of Wooden Pallets for Packaging Industry. The goods packed inside these pallets remain completely protected inside from any kind of damage during storage or transport. In addition to this, our pallets also protect the goods from external adverse effects of rain, water and moisture. Heat treated as per ISPM 15 standards, these have great strength to carry heavy load of machines and equipments. We have an excellent production capacity that enables us to complete our minimum order quantity of 500 pieces on time without any compromise with quality. Apart from protection to goods, the pallet can itself sustain in adverse weather conditions for long time. 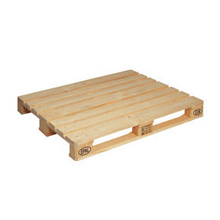 We have designed these wooden pallets wisely and smartly for easy handling.